Outline A vampire hunt brings the Winchesters and the British Men of Letters together. At the Bunker, Mary asks Sam and Dean to hear her out as she tries to justify working with the British Men of Letters. Sam asks Mary when she started working with them, and Mary tells them she started since before the lake house when they took on Ramiel. Sam and Dean's anger regarding Wally's death and Castiel's near-death prompt Mary to tell them she was the one that burned Wally's body and informed his family of his death and that she is doing this for them, that she’s playing three decades of catch-up. Dean answers back to her that their whole lives, she’s been gone. He confronts her about her saying she needed time and space, but really he thinks she needed space from them. Mary tries to argue that it’s not true. And Dean asks her to just try to be a mom. Mary tries to protest, saying it’s not like that. But Dean insists and tells her to leave. Three days later Mr. Ketch and Mary are disposing of a vampire nest together; Mary seems out of sorts and short-tempered. As they head into the compound, Mary goes straight to her room, looking at the multiple unanswered texts she has sent to Dean. Ketch, meanwhile, talks to Mick about the last hunt and they discuss how, while it is good that Mary has joined them, that they need to work on getting Sam and Dean on board. At the Bunker, Dean points out a case to Sam about a dead guy in Akron. Sam chuckles and reads through it, but isn’t sure it's their kind of thing. Dean tries to convince Sam, finally telling him to find a case because he really needs to hit something, now. Sam tries to get Dean to talk about it, but Dean says he doesn’t want to. Even as Sam tries to convince him, Dean tells Sam he’s going out and then he tells Sam that he’s tired of Sam always being a peacemaker, playing the middle. Dean tells him for once, to pick a side. Dean leaves, and shortly after, Sam gets a text from Mary, telling him she needs to see him, and that it’s urgent. At the British Men of Letters Compound, Sam is stunned by the array of computers and tech equipment everywhere. Mick and Mary explain to Sam that the plan is to systematically track and kill every vampire in the United States. Mick introduces the group in the conference room to Sam: hunter Pierce Moncrieff, and BMOL members Alton Morehead and Serena Colman. The meeting starts with discussion about vampires in the Midwest and Serena says that when they started there were 241 vampires active across 12 states, and now they’ve killed all but 11. Alton explains that they’re planning to follow the chain of vampires to the top -- the Alpha Vampire. Dean returns to the Bunker and is dismayed to find they are out of alcohol, but he is soon surprised when Ketch arrives. Ketch offers Dean some expensive Scotch, and they have a drink together. Ketch then convinces Dean to join him on a vampire hunt. However when they arrive at the nest, the place seems empty. Ketch comes in from the stairwell dragging a female vampire. He knocks her around a bit trying to get her to tell them where the other vampires are. She tells him they are hunting the hunters. Back at the compound the vampires attack. Sam takes charge, telling them they need lock the place down. Mary goes on the intercom, telling everyone in the compound to not engage and fall back now. In the meeting room, Mick tells them most of the weapons are in the armory, including the Anti-Vamp Device. Sam wonders if they have anything stronger, and Mary turns to Mick. Mick brings a case to the table and when he opens it, Sam exhales sharply. It’s the Colt. Mary tells him she stole it from Ramiel. Mick tells Sam it doesn't work as they have no bullets. Sam tells them they can make some from a recipe he learned from Bobby Singer. As Mick gathers the supplies, Sam, Pierce, and Mary head to the armory to try and get the AVD, but are attacked. Mick is chanting the spell over the bullets in the command center when the Alpha Vampire arrives and gains entry into the room with the help of Pierce, who reveals himself to be under the employ of the Alpha Vampire. The Alpha tells them he likes living quietly and the British Men of Letters have been making life awfully noisy lately. He tells them that in England, he didn't get involved because England doesn’t matter to him. But America is his home, and it's time for them to stop. The Alpha tells the room that they’re going to bring communications back online, make a call to London, and admit defeat. Then he’ll devour them onscreen to make sure the point is made. Mary and Sam enter the room. Sam attempts to negotiate with the Alpha, but he calls Sam's bluff that the Colt is empty. Mary hits Pierce, and a struggle ensues between everyone, in which Mick manages to get a bullet to Sam. Sam takes aim at the Alpha with the Colt and fires, landing a shot in the middle of his forehead, killing him. 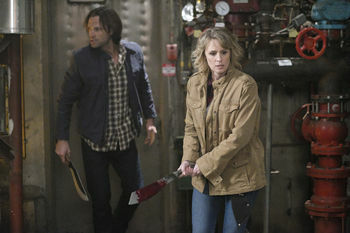 As Mary and Sam clear out the rest of the vampires, Dean and Ketch arrive. Dean calls Sam out on his "went out, back later" note, and tells him that he was on a case with Ketch when they found out about the attack and he drove as fast as he could to get there in time. Sam’s a little shocked, as Dean didn't even know Sam was here. Then Dean looks hard at Mary, and Sam realizes that Dean knew she was there, and was afraid of losing her. Dean turns to Mary and tells her when he thought something might've happened to her, nothing else mattered. He tells her even if he really doesn’t like her choices, he’ll just have to get used to it. As Pierce is being led away in chains, Ketch tells the Winchesters there is nothing pleasant in store for him, to their satisfaction. Dean: You were runnin' an errand for the Brits. You kept it from us. Cas almost died. Mary: Think I don't know? I'm the one who burned his body, I'm the one who told his wife. I watch him die every night. Dean: How 'bout for once you just try and be a mom? Dean: No I need drinks. Plural. And this... whole peacemaker shtick that you've been running, first with Cas, now with Mom, it's getting old, man. Mr. Ketch: You're a killer, Dean Winchester, and so am I. And if we go too long without something to track or trap or punch or gut, well, things get a bit ugly. Don't they? The Men of Letters keep me busy. They point me in a direction and bang. Off to the races. It's not a bad life. Mr. Ketch: Ten blood suckers, give or take. Alpha Vampire: I'm old. I like living quietly. You've been making my life awfully noisy lately. You've killed so many of my children. I've seen your work. In England, I didn't get involved, because, well... it's England. But America... yes. America is my home. And it is time that you.. get... off... my... lawn. Alpha Vampire: That gun can't save all of you. Sam: Who said I was here to save all of us? My family and I, we kill vamps when they get out of line. And you've let us. Alpha Vampire: I have many children, Sam. What's one, two, here or there? Alpha Vampire: Clever, clever boy. Dean: When I thought something might've happened to you, nothing else mattered. Dean: No, Mom, you were... It's not your job to make my lunch and... kiss me goodnight. It's- We're adults. You're gonna make your own choices, even if I don't like 'em. Even if I really, really don't like 'em. That's just something I'm gonna have to get used to. Okay, Mom? Sam: Look, tonight was bad, no doubt, but the Alpha Vampire is dead. You're changing the world, and I wanna to be a part of it. Sam: Give me some time. "The Raid" is a reference to the 2011 Indonesia martial arts film of the same name, about a police force sent to raid an apartment complex run by a criminal. Mr. Ketch: Unpack, reshelve, and my SIG Sauer could use a good scrubbing. SIG Sauer is a brand of gun which is popular with the military, especially Special Forces Units. Sam: Yeah, um, you know, I dig the whole low-budget Mission: Impossible vibe, but I'm gonna head back. Sam could be referring to the series of spy movies or to the TV series the movies are based on that aired from 1966-1973. "Lucy, I'm home!" is a famous line from the 1950s TV show I Love Lucy, often said by Lucy's husband. Mr. Ketch: And whilst I understand that you're not feeling... warmly disposed to me, I wonder, what's your disposition to this incredibly rare, unspeakably expensive bottle of barrel proof Scotch? The label on the red case that holds the bottle of Scotch that Mr. Ketch brought to Dean marks it as 33 year old "Glennlach" Scotch Whisky. Dean did the same thing when he first made inroads with Rufus Turner in 3.15 Time Is On My Side with a bottle of Johnnie Walker Blue Label Whisky. Mick: When we find a nest, we don't just charge a la John Wayne, guns a-blazing. We wait, we watch. John Wayne was an American actor famous for starring in Western movies. "Like a bat out of hell" is a phrase meaning "very rapidly," made popular by the 1977 Meat Loaf song of the same name. The bottom left corner of the article that Dean found states "Denver Police continue to investigate the homicide, Café Elta remains closed to the public." Café Elta was the name of the café where Rowena was recruiting witches from the Grand Coven into her own "Mega Coven" in 11.03 The Bad Seed. Elta is the first name of Danneel Ackles. Kett Turton, who played Alton Morehead, previously played Max Jaffe in 1.04 Phantom Traveler. Pierce Moncrieff is wearing a shirt for Guidry's Cajun Café, the same place Benny Lafitte worked at in 8.09 Citizen Fang. Serena: Your father? The -- the Alpha? No, that's impossible. Our Intel has him in -- in Morocco. He's been there for at least a decade. Sam is referencing their meeting in 7.22 There Will Be Blood. However, he got the location wrong as Hoople is where they went looking but only found the Alpha's "special girl" Emily. Sam met the Alpha in Missoula, Montana. Photo from set by Adam Fergus.